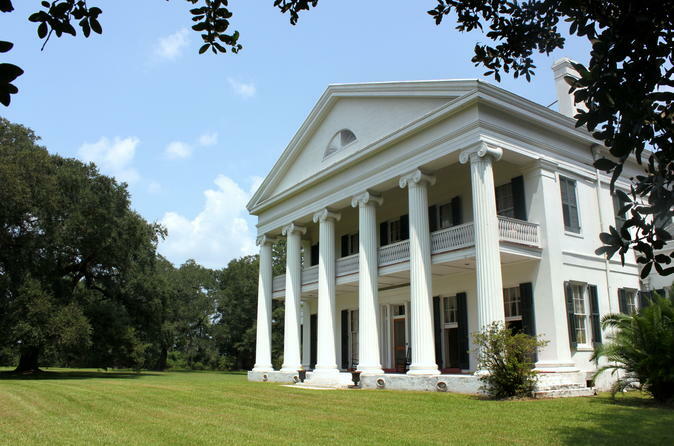 Get a taste of antebellum Louisiana on this all-day tour from New Orleans to two of the finest plantations on the Mississippi River: Houmas House Plantation & Gardens and Madewood Plantation Mansion. Learn about the pre-Civil War history of these sights from your guide as you walk under spectacular oak canopies, admire the well-preserved mansions and enjoy a private elegant seated luncheon, served exclusively for us in Madewood Mansion's ballroom! Limited to 14 people, this small-group tour ensures a personalized experience. After our 14 passenger tour van picks you up from your New Orleans hotel, enjoy a scenic, narrated drive along Lake Pontchartrain. Head upriver along the Great River Road to beautiful Houmas House Plantation and Gardens. Savor a mint julep (own expense) before your mansion tour. Admire the columned exterior of the Greek Revival-style mansion, nicknamed the ‘Sugar Palace.’ Then follow your guide, in period dress, through 16 lavish rooms filled with priceless antiques and artwork from Louisiana artists. Stroll among gorgeous old oak trees and savor the warm breeze. Cross the Mississippi on the Sunshine bridge.Then, after driving deep through sugar cane fields into the heart of Cajun Country, we arrive at Madewood Plantation for a private lunch, served just for us, in Madewood's elegant ballroom. Following lunch (cost included), our small group will experience a privately guided tour of this charming antebellum mansion. Famous New Orleans architect, Henry Howard, built “The Gem on the Bayou” in 1846. Next, hopping in your van for the drive back New Orleans. Your 7-hour tour ends with drop-off at your hotel.